Big Bang. Photo Martin Argyroglo Callias Bey. WE ARE LIVING IN UNCERTAIN TIMES. STABLE CLIMATE, LIBERAL DEMOCRACY, CAPITALISM AND THE GLOBAL DOMINANCE OF WESTERN CIVILISATION ARE ALL LOOKING LIKE THEIR TIME MIGHT HAVE PASSED. A SIMILAR SENSE OF IMPENDING CRISIS IS TANGIBLE ACROSS THE STATE FUNDED ARTS IN EUROPE. THIS YEAR’S EUROKAZ PROCEEDED IN A SPIRIT OF AUSTERITY, ITS BUDGET REDUCED BY A STAGGERING 30% AT THE 11TH HOUR. With the program accordingly thinner, it was hard to escape the feeling that much contextualising of the remaining works had also disappeared. The curatorial thread of the festival was reduced to a dashed, disconnected line: successful works remained, but were significantly less eloquent about each other than is usually the case. Between tableau theatre, Congolese performance, dance on science and an entire video retrospective on Christoph Schlingensief, critics had to deal with a cacophony. However, the highlights of the festival could be lined up as examples—if stand-alone—on how to speak, how to make a sound, on the future of the world. This year’s program-within-the-program consisted of four performances by emerging artists, created within the European Focus on Art and Science in the Performing Arts. Unfortunately, the majority of works presented could be dismissed as Chunky-Move-on-a-Shoestring. The conceptual framework often appeared no deeper than placing a machine among the dancers and turning it on, but the machines—unlike Chunky’s often brilliantly innovative technology—seldom excited with their possibilities. So Santasangre’s Bestiale Improvviso (Beastly all of a Sudden) delivered dancerly twitching to harsh sounds and stormy lighting, atmospheric but hardly thought-through. Technology in this context, disappointingly, was largely interpreted as noise and flashing lights, a well-worn metaphor for impending catastrophe. In contrast, WE GO vzw/Vincenzo Carta presented Gnosis #1, a research-driven work, the main thrust of which was the dancers’ states of mind activating stage lights of different colours. However, while this resulted in fairly opaque stage business, the mechanics of the translation of mind to light was never explained sufficiently, leaving the audience sceptical as to the exact method employed and unable to judge its success or failure. I would single out Dewey Dell’s Cinquanta Urlanti Quaranta Ruggenti Sessanta Stridenti (Furious Fifties, Roaring Forties, Shrieking Sixties) as the most successful in this program—not because it offered significantly greater dramaturgical thrust (it did not), not even because it engaged with technology beyond the obvious (it did not), but because its sheer strangeness was unapologetically devoid of either facile catastrophism or technophiliac laziness. Three young women, the next generation of the Castellucci family, appear on stage in padded black unitards that exaggerate their thighs, white-painted arms and faces in similar blistering white, but with central black circles, resembling the traditional Venetian moretta (or ‘mute maid’—a small, round woman’s mask, held in place by biting onto the button on the underside). A series of very simple movements—arms slicing, small hops, upper body swaying—rigorously correlates with Demetrio Castellucci’s music, a rhythmic bunch of roaring, shrieking noises, every so often embracing a broad tune, such as a two-tone siren wail. But instead of attempting to illustrate a tragedy, Dewey Dell create a dark, childishly primal pantomime of a badly remembered nightmare. There are seas, shipwrecks, maidens in distress and sandmen in this show, all executed in an aesthetic realm halfway between Lemony Snicket and Michel Gondry’s music video for Daft Punk’s “Around the World.” Vaguely built around the mystical harshness of the Antarctic winds, the performance lacks the maturity of Societas Raffaello Sanzio’s adult works, but is powerfully visceral in the best sense of the word. From these relatively superficial explorations of a noisy cataclysm, Philippe Quesne and Vivarium Studio proceed to play with silence. Big Bang, defying expectations, opens with a woman reading at a table, silently constructing the word BANG from wooden letters. The end of the world again. However, instead of pathos, Quesne offers soft, benevolent humour. The evolution recommences. Amoeba-like creatures, crawling on barren land, rise into hairy apes around a fire and surprisingly quickly evolve into humans sitting in an upturned car, reading Chris Ware’s comics and drinking canned beer. A lake appears, as do astronauts, and someone is always walking around with a sketchbook, finding aesthetic pleasure in the apocalypse. The scale shifts between miniature and lifesize, a number of performers in green overalls walk around unperturbed, setting the scene, and a small island is formed from the debris upstage. Quesne’s background is in set design, and the work builds as a series of gradually shifting tableaux; the dramatic structure is entirely unencumbered by words. His professed aim is to develop a new dramaturgy that evolves around an almost anthropological observation of the human microcosm, sidelining the simplistic inquiries of text-based theatre. Ambitious. But Big Bang—despite sometimes gruelling slowness—is never hostile to the spectator; Quesne has quickly become an audience favourite in France. His post-Bang trajectory from plankton to postmodernism is gentle, melancholy and humorous and we are quietly entertained despite having sat through the end of the world—twice. However, Big Bang also plunges one into the sludge of First World resignation, no less genuine, or troubling, for its Tati-like sweetness. Watching it almost feels like making peace with despair—or perhaps walking into and through it. More more more future. Photo Agathe Poupeney. Faustin Linyekula and Studio Kabako’s More more more…future begins where Quesne ends, with impotent silence at the end of the world. Linyekula starts at a real, non-metaphorical place of catastrophe: his native Democratic Republic of Congo, still blistering from the biggest war in African history. Trying to use the social power of music, Linyekula wants to marry ndombolo—hugely popular Congolese pop music, wild and energetic and profoundly escapist, carrying with itself a culture of bling—to the political spirit of punk. The show is structured as a musical performance, centre-stage given over to the Kinshasa guitar sensation Flamme Kapaya. 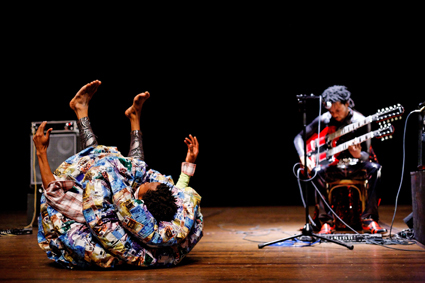 He performs a powerful mix of hip-swinging ndombolo and raging rock to the seething lyrics of poet Antoine Vumilia Muhindo, a political prisoner in Kinshasa and Linyekula’s childhood friend. While the musicians are dressed in ‘authentic’ ndombolo glitter and gold, the three dancers wear frilly, ballooning outfits made from refugee bags [cheaply made sacks of woven nylon fibres. RT Eds]. They begin with simple ndombolo dancing. As the music heaves and grows in anger, the dance transforms into trance, madness and, finally, violence. The energy on stage is numbing. Why not live for today, if there is no tomorrow? “Carpe diem, even if it’s the middle of the night.” And then, after the physical fighting has subsided, the thread of the performance is slowly picked up again. Writing on political performance, cardinal Flemish dramaturg Marianne Van Kerkhoven has said, “A process of truly interiorising the social options is for the ‘political artist’ probably the most important artistic deed.” This is a profoundly political work, agitating without propaganda and empathetic without resignation. Unlike others in the program, it is not a romantically apocalyptic narrative, but an attempt to articulate a way out of a real cataclysm. In a Gramscian sense, it couples pessimism of intellect with optimism of the will. Linyekula does not romanticise the political power of music, nor African sensuality, but neither does he cerebrally avoid them. Instead, he acknowledges ndombolo’s agonistic tendencies, seeks to uncover its generative potential and allows it to disintegrate as it naturally would. Yet the performance does not end in despair, but with sombre, tenacious hope. Linyekula goes that one step beyond Robyn Orlin’s Dressed to Kill…Killed to Dress… (RT 87,p38), not simply staging a culture of escapism and excess, but pushing it to come to its own catharsis. An ethical question that increasingly troubles me at Eurokaz is the misplaced colonialism of the continuous importation of First World melancholy and cynicism, through art, into a culture of a developing country. It is often genuinely unsettling to see the apathy of a consumer society, in which all of one’s insignificant wishes are a priori sated, performed in front of an audience of precariously-employed, politically disenfranchised, economically doomed citizens of an unstable democracy. Last year’s Ballad of Ricky and Ronny (RT 98, p125) was one such instance, this year’s Big Bang another. The high value accorded to such art, its forms and ideas, always teeters on the possibility of creating an educated apathy where it is least needed and imports melancholy as a baseless fashion. There is a place for melancholy performance, and for apocalypse, but there is also a somewhat conspicuous excess of both in the world today—perhaps a natural extension of the general state of crisis we are living through. There is a lot more to take home—from the kind of questioning to the cathartic path out—a lot more that is intelligent, emotionally rich and, ultimately, new from the work of Faustin Linyekula. First published in RealTime Arts, issue #105, Oct-Nov 2011, pg. 4.